Just a few more days until Sweetest Day (don’t worry, boyfriends and girlfriends, you have until Saturday, October 18 to buy something for your sweetie)! Most people don’t know what Sweetest Day is. Skeptics call Sweetest Day a Hallmark holiday or a “concocted promotion” to increase the sales of candy, greeting cards, flowers, etc. The romantic in me likes to acknowledge any holiday that celebrates love. So, I decided to look more into the holiday…what is its real purpose? Who celebrates Sweetest Day? Is it really a gimmick? 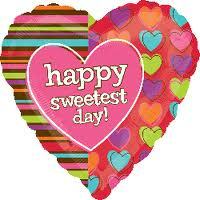 Sweetest Day takes place on the third Saturday of October every year. Friends, families, and couples express their love for each other by sending sweets, flowers, greeting cards, or other tokens of love. It turns out that Sweetest Day is most often celebrated in the Midwestern United States. To my surprise (and how ironic), Sweetest Day originated in my new hometown, Cleveland! The first Sweetest Day was October 8, 1922. The Cleveland Plain Dealer stated that candy maker C. C. Hartzell chaired a committee of 12 confectioners to plan the first Sweetest Day. The Sweetest Day in the Year Committee distributed over 20,000 boxes of candy to “newsboys, orphans, old folks, and the poor” in Cleveland. According to Mt. Vernon News, “the original theme of doing a good deed and spreading cheer to those less fortunate still applies, [but] the holiday has broadened to celebrate love and romance for significant others while still including friends, neighbors and co-workers.” Several candy makers tried to declare that it was Candy Day as well. So if anything, Sweetest Day was originally promoting candy sales. The Cleveland committeemen who planned Cleveland’s Sweetest Day, published in The Cleveland Plain Dealer on October 8, 1922. While often cited as a “Hallmark holiday,” Hallmark didn’t make Sweetest Day cards until the mid-1960’s, and now has 151 different versions of greeting cards (80% are romantic). American Greetings, whose headquarters are in Cleveland, began making Sweetest Day cards in the 1930s and now has 178 different kinds of cards. Sweetest Day is not as impactful as Valentine’s Day, but it does boost business for greeting cards companies. Skeptics, you may be right that it is a commercial holiday. But why not remind your significant others, family members, and friends that you love them? While the holiday may seem narrow in scope (as it is often only celebrated in one part of the United States), the premise to acknowledge the ones you love can be celebrated anywhere. So, this Saturday, why not spread the love or be romantic? Below are some sweet quotes about love that may inspire and remind you why love matters. Happy Sweetest Day!